$25 for wire transfers, $100 minimum withdrawal limit. $5,000 maximum withdrawal limit. LBinary is no longer operating as a binary options broker. The review below is presented for the archiving purposes. LBinary is a binary options broker based in Nicosia, Cyprus. The website was registered in February of 2013, and being quite new there is very little information available on it. Indeed, searching for information about LBinary, we found only a single review and no other hits. Furthermore, the website itself had a lot of information gaps and it took quite a bit of digging to find even some extremely basic information. The site lists awards which do not seem to actually exist, and they are extremely limited in terms of features. While their platform is definitely SpotOption, their brand is unconfirmed on the SpotOption website. Following is all the information we did find or piece together. To be fair, since the website is only a couple of months old, that is probably a large part of the reason that it is so lacking in features and reputation, but it does not seem to be off to much of a start. The sign-up process on this website is fast and easy, and you can deposit in Euros or US Dollars, starting with $100 minimum or equivalent. While trading in Yen is mentioned in the FAQ a couple of times, this option is not offered when you make your deposit. You can transfer your money via credit or debit card, wire transfer, or CashU. The only fees are $25 fees for withdrawals, and there is a $100 withdrawal minimum. While this is a pretty common feature even among legitimate brokers, it is one more irritation since it makes it hard to withdraw your own money. Imagine if you deposited the minimum without paying any heed to the withdrawal minimum, lost a single trade, and wanted to take out your remaining money. You wouldn’t be able to access it anymore. Five different account tiers are offered: Micro, Silver, Gold, Expert, and Platinum. The Micro account starts at $500 and comes with email and live support 24/5, and an account manager. The benefits and features increase when you deposit more money. The highest tier, Platinum, is available to customers who deposit $50,000 or more, and comes with a lot of features. Along with the email and live support 24/5, you get account management, quick money transfer procedures, a 60-minute lesson in trading binary options, trading strategy information, one-on-one trading, and a VIP phone line. While these benefits sound outstanding, it is hard to picture that they would actually deliver on them. Amusingly enough, when we tried registering on the website and then checked our email to confirm that USA traders are permitted, the subject line read, “Ok, you can trade now,” and there was no content at all in the body of the email. The email didn’t exactly exude confidence and professionalism. LBinary offers 60 different assets including the usual range of commodities, currencies, stocks, and indices. High/Low, One Touch, and 60 Seconds trades are available, as well as Option Builder so that you can customize your expiry times. The format of the screen and the presence of Open Platform confirms that this is a SpotOption powered website, despite the fact that there are no actual references to SpotOption technology on the site. SpotOption is an excellent platform that is easy to understand and use. There are however dozens of other binary options sites which use this platform which would be better to trade on. The minimum trade size is $25, and the maximum is $1,000. Double up and rollover are offered so that you have the option of extending your winning trades or adding money to them to enhance your profits. 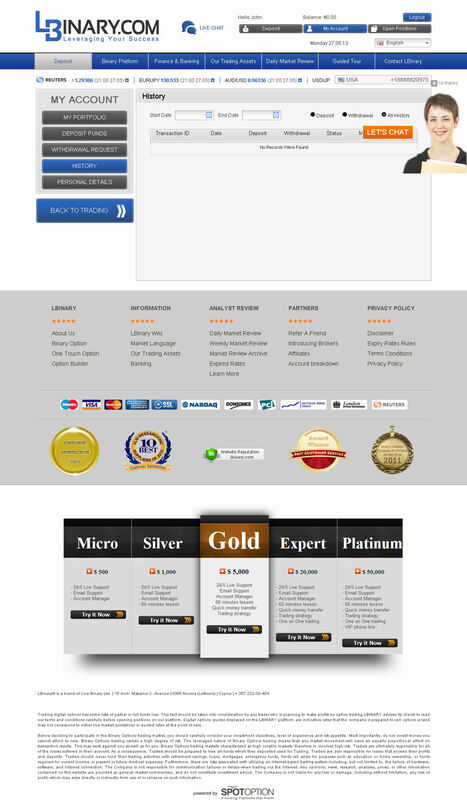 You will also find daily and weekly market reviews on the site to help you with your trading. The only other resources you will find on the site include a glossary, a FAQ, and standard how-to pages. A video demo is forthcoming. There is no actual demo account though, and no mobile trading support either. Customer support options include phone numbers in various countries, email, web form, and live chat. We sat on the live chat line for about a half hour on a weekday during normal market hours and nobody was there to respond, despite the claim of 24/5 customer service. It is possible that the line was simply busy, but this is unlikely given that unstaffed live chat desks are unfortunately the norm with binary options brokers. There are brokers however that will quickly assist you on live chat, even though they likely have a lot more customers than this site. LBinary does not have much of a reputation to speak of. As mentioned earlier, there is literally one other review for the website online, and it is from an affiliate account (nor is the information in it completely consistent with what is on the website currently). There are no community posts about LBinary either. But what is really interesting are the awards listed near the bottom of the LBinary webpage. The first award doesn’t actually list an awarding group. The second award was apparently given by VLSIresearch Inc. The provider does exist, and it does give out Supplier awards, but the awards are for nanotechnology and semiconductors and similar electronic systems. The company appears to have nothing to do with binary options trading or trading in general. Another of the awards listed comes from World Finance, and reads “World Finance Trading Platform of the Year 2011.” This is an invalid claim for several reasons. Firstly, a website registered in 2013 could not have won an award in 2011. Secondly, World Finance’s Exchanges & Brokers awards in that year did not yet include binary options categories. Thirdly, the winners for 2012 included Banc De Binary, Option Bit, 4XP, Start Options, AnyOption, EZ Trader, and 24option. This is a new website, so it would not be entirely fair to say that they are definitely an illegitimate company. They may have misinformation like this in place as a placeholder while they work on building up their client base and earning some real reputation. The fact that they are going to start out by being misleading does not lend a lot of credence to their trustworthiness or validity, however. This along with the absent customer service are our main reasons (more so than the lack of features, which is expected given a brand new site) for recommending that traders avoid this site, at least for the time being. I registered to check out their platform, but did not deposit. Got several phone calls on my cell while at work, asking when I will be depositing – not interested and don’t call me when I’m at work during the day. Then a male broker called and in a very angry and threatening voice told me I owed him money! I must deposit immediately! His commission salary was based on my deposit, so when I registered I was committed to making a deposit – when will I pay up? I told him if he ever called me again I’d report him and the LBinary to the business authorities.for threatening customers. i call many places and to uk they talk me the lbinary was not legal on the stock market and when out off business.. In May 2014 I invested $333.00 with LBinary and made numerous attempts to get responses to my questions and access to my account . BUT to no avail. Is there some way to find out how to get my funds back or access statements on the account. I also was cheated by LBinary! I made money, but they did not want me to withdraw my winnings! They did not want to refund my money that I’ve put in! They wanted more money, and when I refused, they just went into my bank account and withdraw another $250! I put in a complaint to the bank, my bank contacted me, straight after the complaint, and contacted LBinary! After that LBinary refund me the $250 they took out of my bank account without my consend, but not my first $250 I put in to start trading! LBinary did not want me to withdraw my winnings or refund my $250! Please people be aware of this con people! Disgusting and a shame that people like them still walking the earh! Lbinary took out 5000 Euro from my credit card. Than within 6 months their automated service just swalowed my account to zero. There was no stopping it. I tried to get it fixed but LBinary was suddenly no more interested in getting in touch with me. Al my mail stayd unanswered. Itsa bunch of thieves and they seem to get away with it. I have been looking for Lbinary criminals for 2 years when they disappeared off screen in 2016. I was defrauded out of USD 20.000.00 I am still looking for them . Because when i spoke to the CEO on the phone he said i will never see my money again ,the worst part was i heart laughter in the background from his fellow criminals , their trading platform was completely manipulated for losing our hard earned money . I really want The low life brought to justice. Hi . I am still looking for employees at LBinary they stole USD 20.000.00 from me when they disappeared in early 2016 . their trading platform was manipulated by staff so you lose. They refused withdrawal attempts , they set out to defraud and steal from the beginning . My senior manager used the name Michele Zapos. Lets get these criminals .